What is the collegial model? The collegial model is based around teamwork – everybody working as colleagues (hence the name of the model). Collegial refers to a highly co-operative set of people working together by dividing the labour among themselves for the sake of efficient working and to achieve organisational goals. This model is a sensible extension of the concepts proposed by a supportive model of organisational behaviour. It promotes mutual co-existence that should exist for maintaining harmony among the co-workers. As you can see, the easy way to recall these components is to use the letters ABC. Cognitive component involves the belief or knowledge of the person. This base knowledge is usually objective and without any emotional element. In order to have a healthy business that evolves exponentially and which provides a constant stream of revenue, you need to make sure that not only you create good products/services that cater to the needs of your clients, but you also need to maintain your employees happiness at the same times. 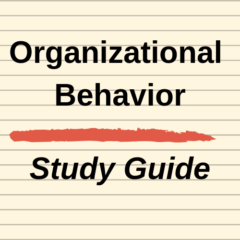 In order to do that you will need to implement and use some behavior management practices in your company, as this will allow you to please your employees and customers in the best possible way! Perception Definition: A perception is a belief held by a person, or many people, based upon how they see the world around them.